Haven't posted here in ages because I took a very long break from Morse learning. Over the U.S. Thanksgiving break I finally got back into it. Using the Koch method, I am doing drills for five minutes, every hour, during the working day (I run my own business so no problem with that!). So that's more than one hour a day, split into tiny chunks. I'm diving in at 18wpm and managed to get back to a 16-learned-character level today. I am adding one character a day. That should mean that I could finish my Morse learning in just 3 weeks -- to get to the 40 learned characters (letters, numbers, and a few punctuation marks). I will post daily on my progress. Very narcissistic but I need some "accountability" and this is a pretty good place to get that, I think. Stay tuned (or tune out, depending on your reaction to this post!). I second real on air RX , if you rely on computer generated well sent code it can be quite a shock when you hear some of the stuff sent on air . Not normally a problem when your used to it . Spelling mistakes is quite common but I find that's not an issue as I make mistakes also and it doesn't tend to be an issue but you will hear all manner of weird ditties that people must make up thinking they are sending something else or just bad sending ,be it timing or whatever . BUT that said computer generated code is the way to go to get the basics down in the old grey matter .. So here are the 16 characters learned so far: K, M, R, S, U, A, P, T, L, O, W, I, ., N, J, E.
Accuracy on last copy test with 16 characters: 94 percent. Today I am adding the 17th character which is F or di-di-dah-dit. (1) I'm already copying QSOs on the air but with the Koch method you start off with only a few characters. I'm now reaching 17, which means I can copy bits and pieces of QSOs but "drop" a lot of characters because I haven't learned them yet. (2) I haven't built my transmitter yet; my station is being entirely homebrewed. However it won't be long before I build it! (It will be a two-tube crystal-controlled design from the 1960s.) I am however practicing sending CW with a code oscillator and Ameco K-4 key. It took me a LONG time to get over counting dits and dahs in my mind. Thanks, good advice! I am aware of the "trap" of thinking in "dots and dashes" -- so far it's going OK, the letters pretty much come straight from my headphones into the tip of my pencil without "thinking" about it (it's just a reaction to a particular set of sounds). If you start "thinking," you will drop five or six characters in a row! In any case I've got the software set to 18wpm so there really isn't any point trying to "analyze" what's in the headphones -- there just isn't enough time! I had a 4-day weekend this past Thanksgiving that I practiced CW too. I've been learning CW at 18 wpm for each element with (5 wpm spacing between elements), and I really do not know how many dits and dahs there are. What do you do when you want to send these elements? You will have to know what the dits and dahs then? I have a code oscillator and key from MFJ, but since it uses the 555 timer, it has square waves which do not sound pleasant compared to real CW I hear on the radio. I try to listen to CW on 40 or 80 meters, but I haven't gotten to the point I can understand the Morse code. This might be Off-Topic for the CW forum, but do you care to share your design plans for your homebrew code oscillator and regenerative receiver for multiple ham bands? I want to build a regenerative receiver one day. I've looked at a lot of diagrams online or in books, but I am still unsure. I do not have enough knowledge and experience to design my own radio yet. Unless, you count the TRF radio I built, but that is basically a crystal radio with amps and a variable capacitor to tune. What do you do when you want to send these elements? You will have to know what the dits and dahs then? I agree that this is a problem, although CW Elmers on this forum found this odd when I mentioned it some time back. The mistake I made, initially, was to practice only the copying and not the sending. I now find that as long as I practice sending often enough (I spend about one minute on sending for each four minutes of copying), the problem solves itself. In fact, I find that receiving and sending mutually reinforce each other. .... but do you care to share your design plans for your homebrew code oscillator and regenerative receiver for multiple ham bands? I want to build a regenerative receiver one day. it has square waves which do not sound pleasant compared to real CW I hear on the radio. Even the sounds produced by Morse practice computer programs often sound horrible when compared to code heard on the air. G4FON has ways of altering the sound that make it less unpleasant and more "real", but most of the rest don't. One way I've found of making a horrible sound bearable is to turn the volume way down til it's only just audible. I do that with LCWO. old transistor radio will give you the parts to build a sine wave audio oscillator. The sine wave is what makes it sound nice. As far as a circuit, an oscillator is nothing but an amplifier with induced feedback. It is the RC timing that will set the frequency. The sine wave is what makes it sound nice. As far as a circuit, an oscillator is nothing but an amplifier with induced feedback. It is the RC timing that will set the frequency. Yup, my HOMEBREW oscillator sounds fairly nice and uses a couple of vintage RCA transistors from the 1960s. 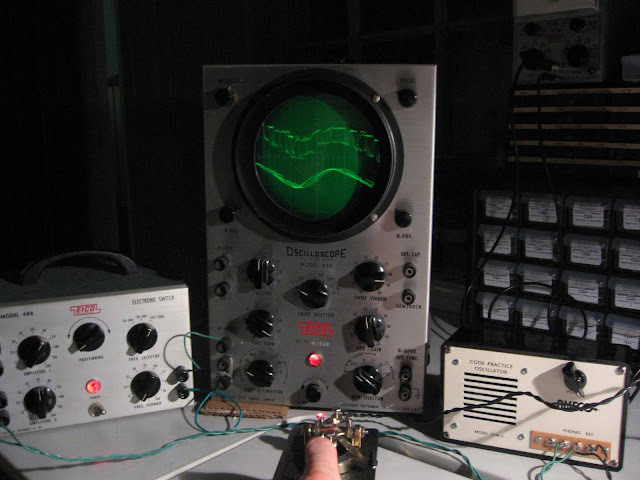 I have NOT yet had a chance to view the output of my homebrew oscillator on an oscilloscope. The sine wave is what makes it sound nice. So here are the 17 characters learned so far: K, M, R, S, U, A, P, T, L, O, W, I, ., N, J, E, F.
Accuracy on last copy test with 17 characters: 92 percent. Today I am adding the 18th character which is ZERO or dah-dah-dah-dah-dah. I will also make an effort to improve my sending by using the PCW-fistchecker program (see the separate, very useful thread titled CW Spacing). I'm glad to see someone else has the same thought. Mine is really that I hate short characters. I set up "Just Learn Morse" with words based on short characters like 'e', 'i', 's', 't', etc and they go by so fast I recognize them, but can't process them into a word. I guess that's what the "Practice make perfect" phrase was meant to address. So here are the 18 characters learned so far: K, M, R, S, U, A, P, T, L, O, W, I, ., N, J, E, F, 0. Accuracy on last copy test with 18 characters: 93 percent. Today I am adding the 19th character which is Y or dah-di-dah-dah.